1. When you see people sitting alone (or apart from the crowd), be sure to ignore them. You certainly need to avoid asking all of these types of questions if you want to get rid of those pesky new church members. 2. Whatever you do, DO NOT introduce new church members to anyone else they might become friends with. You wouldn’t want a new church member to meet anyone they might like better than you. If they did, they might stay in the church. You definitely don’t want to introduce an artist to other artists. Don’t introduce a musician to the worship pastor. Don’t introduce a divorcee to a women’s support group leader. Definitely don’t introduce a single mom to other single moms, or to the children’s director. Don’t build bridges. Don’t facilitate relationships. Don’t do anything inconvenient or go out of your way to bless anybody. Just do whatever’s easiest for you, which is always walking right by without acknowledging the new member (see point #1). 3. No matter where they are sitting in church, ask them to move and tell them that’s your seat. After all, your tithe paid for that exact seat, and you’ve been sitting in that seat so long there is mold growing in it. You would not want to sit anywhere else and start a new collection of mold. Therefore, no matter how sensitive the new church member might be, or how badly it might hurt their feelings, INSIST THAT THEY MOVE. This works really well especially if someone already has any kind of rejection complex or emotional wounds. It’s definitely a tactic to consider if you want to get rid of your new church members. 4. Never invite anyone out to get lunch, dinner, coffee, or ice cream. A terrible thing happens over restaurant tables everywhere, every day: People talk. They get to know each other. They ask questions about one another. They find amazing similarities in each other. They laugh. They cry. They pray for one another. Do not, by any means, go there if you want to get rid of your pesky new church members. Whatever you do, avoid inviting them out to eat at all costs. 5. Recruit new church members into leadership as soon as possible. It doesn’t matter how long they have been saved. If you really want to get rid of those new church members, draft them into leadership ASAP. This works really well because a new convert’s shoulders aren’t wide enough to carry the burden of leadership yet. But, if you can make them believe that they are ready, then you can get them caught up in the snare of busyness so they don’t have time to build a solid foundation of Word, prayer, and teaching. Another plus with this method is that your new church members won’t have to worry about that annoying thing called character growth if you put them into leadership. They’ll be too busy trying to take care of other people to get stable themselves. Those are the 5 top ways I could think of to help you get rid of your pesky new church members. If you’ll do all of these things, your church pews will be as empty as the ones in the photo above in no time. 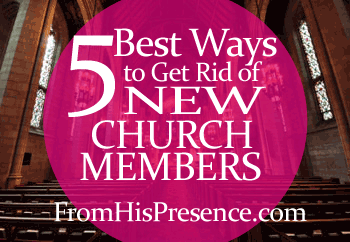 What other ways can you think of to get rid of new church members? Leave your ideas in the comments! Yes… that is definitely a problem. 🙁 I’m terribly sorry. Sometimes some of this applies to old church members too. 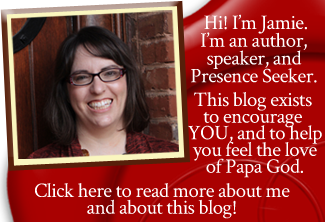 Have you ever felt invisible at church? One reason why churches don’t grow. I messaged you privately, Pat. Yes, I have felt invisible. When I first started going to my church, I didn’t know anybody and was too shy to know how to get to know people. I wasn’t in a Lifegroup or anything, but one day, the ladies’ LifeGroup teacher from the singles’ class plopped down on the pew next to me after church and asked me out to Steak-N-Shake with her. I went and that was the connection that got me plugged into a LifeGroup and into the intercessory prayer meeting. That one connection changed my life and took me from feeling invisible to starting to make friends. (And that’s how I met you in intercessory prayer!) Without a place to plug in, we only rattle around in a large space… but as soon as we find that place, we’re a very visible part of the family. I’m sorry to say i put this post on pinterest and someone wrote to me telling me she and her family are new in church. She accused me of not loving my neighbor and not having love in my heart. I apologized to her and explained these are the things NOT to do to new church members. I hope she understands the message. God bless you. Hi Carmen, I’m sorry that happened. I tried pretty hard to make sure that if someone read the full post, they would see that I was encouraging people that they SHOULD reach out, help new people make friends, etc. It was totally tongue-in-cheek. I’m sorry you’ve been bruised, friend, but I can’t agree. Every pastor I have ever known has had a real heart for sheep, and does his or her best to care for them. It’s not an easy job, but they do it because they’re called. If you’ve been hurt, I pray Papa would heal your heart as only He can. Incidentally, if someone doesn’t support the pastor, I’m wondering why they would be at a particular church?